As we pass peak oil and then peak energy what will happen to the massive infrastructure and engineering marvels of our global society when we no longer have the energy, resources and technology to maintain them? All we need do is look to the past for answers. What happened to the infrastructure of past civilizations; Egypt, Greece, Rome, Mesopotamia, the Mayan, Incan, Aztec empires? Nature reclaimed them, and was not particularly kind in the process. The wonders of Egypt had to be dug out of an ever-expanding desert. 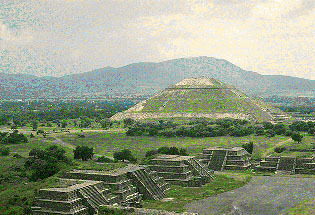 The massive temples and creations of the past empires of the Americas had to be resurrected from the overgrowth of encroaching jungle. The remains of the Roman Empire and ancient Greece had to be exumed from beneath the natural landscape of Europe. Nature does not lovingly or dutifully maintain our creations for us. She doesn't give a damn how much effort we put into them, how important they were to us. Nature is dynamic, constantly changing. Permanence is a human myth totally at odds with nature's reality. Infrastructure is the hard wiring of our society. Much of it is invisible. To those living within the embrace of that infrastructure it is taken for granted, is seen as permanent, the foundation of that society and of their individual lives. But it seems so because there is an army of people and a kalaidescope of technology that is constantly working to keep it maintained. While past empires were alive and vibrant similar efforts and energies and armies of people, many of them slaves, were maintaining their infrastructure, maintaining the impression of permanence by keeping it clean and safe and polished and in working order. When those empires fell and all of that constant maintenance ceased that impression and myth of permanence fell apart and the inevitable reality of deterioration set in. There was a major difference in those past empires, a serious contrast to our current global society. They were built to last, designed for permanence, strong, durable, bold. They were built of stone. And that intent of durability and the materials they used are the only reason there was anything left of those empires for our modern day archeologists to dig up, uncover, retrieve, resurrect. But even this was but an abstract impression of what that civilization was. What was left to recover was bits and pieces of the puzzle that had enormous holes from the missing pieces. They were haunting images of what was that gave little clues as to how those past great civilizations functioned on a day to day basis. With these clues from history should we expect anything different of our own dangerously impermanent infrastructure when our desire, commitment and ability to maintain it begin to falter? Even without catastrophes like New Orleans, Banda Ache, floods, hurricanes, landslides, earthquakes, et al, that infrastructure will continue to deteriorate long after the maintenance has ceased. Much of that infrastructure will be increasingly dangerous as it deteriorates. bridges, overpasses, underpasses, tunnels, elevated highways, canals, water diversions, levees, dykes, dams, aquaducts, reservoirs, sewer systems, water systems, cable systems, underground power lines, airports, supertankers, weapons silos, reservoirs, nuclear power plants, zoos, river channels, steel and glass skyscrapers, apartment towers, prisoners, passenger jets, munitions depots, the chunnel, flood control systems, arenas, stadiums, coliseums,race tracks, elevator, underground service corridors, subways, elevated transit systems, race tracks, amusement parks, communication towers, space junk, theaters and concert halls, wharves, marinas, parking lots, rail yards, dry docks, storm barriers, irrigation channels, transmission lines, highway service centers, warehouses, agricultural terraces, walls and barriers, grain silos, multi-level car parks, pressurized storage tanks, toxic waste depots, settling ponds, etc., etc., ad infinitum. It is not just an issue of deterioration. It is an issue of increasing threats to safety and security as that infrastructure deteriorates. One of the sad lessons of the past century is that one of the first cost-saving measures that is turned to when things get tough is infrastructure maintenance. Maintenance does not make money. Too often it is done at all only because there is legislation and laws that demand it. Look around you. Look at your community. Make a mental note of all of the infrastructure on which your community depends for its smooth functioning. Think about the maintenance that keeps that infrastructure functioning. Think about where the funds for that maintenance comes from. Think about what will happen to that source of funds when we pass peak oil or the economy falls apart or any of the other serious scenarios that may befall us in the near term future. Ask yourself if you are comfortable with that. This is an admirable examination of one of the major problems facing society, maintaining the vast complex infrastructure of civilization that has been built up. The build up, operation and maintenance of this infrastructure entails the irreversible draw down some of the limited natural capital. It is an unsustainable process. Methane Hydrates: the next great energy source? Who will Preserve Knowledge Post-peak?